The book is completed! I turned in the final edits and got the “looks good” from the editor. Whew! I just didn’t think I could let go of it. I’ve lived with this book for a long time. It’s like a strange security blanket. I’ve written lots of stuff, but this was a tough. It was hard because I have so much of me in these pages. It was a blessing to write this book! A blessing and an honor — one that I’m humbled to have. I still stand in awe of a God that has called me to write for Him and share this message of friendships and amazing grace. This still just blows me away! How cool is God! My name may be on the cover, but there are two incredibly gifted, talented, and wonderful women of God who walked me through this process. Debbie sent me these long encouraging emails and listened to me while I cried. I know she thinks I’m just slightly off center – okay, she probably thinks I’m seriously off center, but she never showed it. She was gracious and just great. Jennifer took her time and energy to take this book from something that I’d lived with so long it was starting to show wear. Think of those favorite old jeans – they’re crumpled, lived in, and a little faded, but you love them. That was this book. Jennifer took those faded, wrinkled jeans and made them all pretty and pressed. 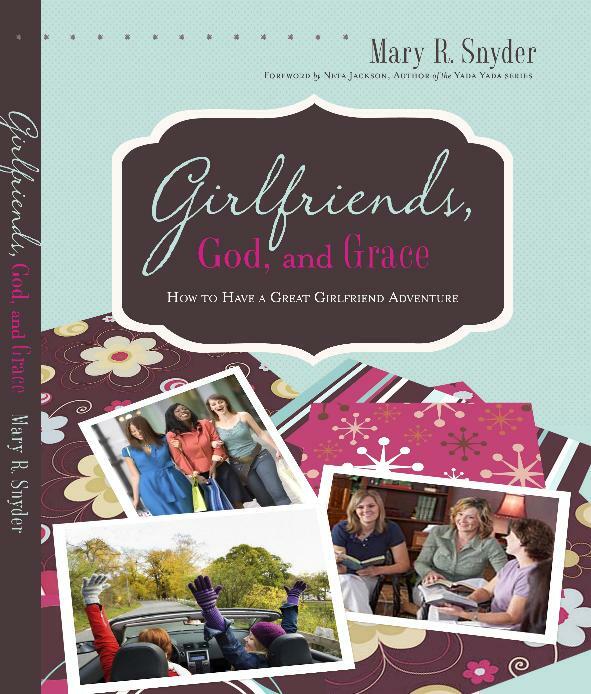 These women molded this book into something that is fun to read yet practical for women everywhere.. It’s filled with insight on all things girlfriend and it tons of great ideas. But I didn’t want this to be a commercial. I just wanted to sing (no, you don’t want me to sing) shout the praises of these two awesome women. These are two publishing Super Stars! And here’s the new cover (we may change the one of the pictures just slightly), but this is the general design! I love it! I love the colors and I love the convertible! Thanks for voting on the covers. This was the one that most everyone loved, including me but I couldn’t do the scrapbooking part. I’m not a scrapbooker and I was afraid that it would lead people to believe I scrapbooked and then I’d have to start scrapbooking — we can’t have that. Thanks to Jeanette we have this great multi-picture book cover idea! Thanks chickie! You know I think you’re great! Thanks to all who voted! Hope you like this one. Wow, what a long road it has been. I am so blessed to call you my friend. I just have to say that the book cover looks just like us, don’t you think? I am so proud of you. Seeing you from a personal standpoint I can truly see growth in your life as you have listened to and allowed God to work through you. You are the awesomest (is that a word?!!!) friend. I love you, my sister.